The image below depicts a diagnostic algorithm for hypoglycemia. The glucose level at which an individual becomes symptomatic is highly variable (threshold generally at < 50 mg/dL). Carefully review the patient's medication and drug history for potential causes of hypoglycemia (eg, new medications, insulin usage or ingestion of an oral hypoglycemic agent, possible toxic ingestion). True loss of consciousness is highly suggestive of an etiology other than reactive hypoglycemia. Elderly persons exhibit fewer symptoms of hypoglycemia, and their threshold of plasma glucose is lower at presentation than in younger persons. Selective percutaneous transhepatic venous sampling may be performed to localize an insulinoma to the pancreatic head, body, or tail. Selective arteriography is also often helpful in localizing insulin-secreting lesions. The mainstay of therapy for hypoglycemia is glucose. Other medications may be administered based on the underlying cause or the accompanying symptoms. Definitive treatment for fasting hypoglycemia caused by a tumor is surgical resection. The success rate is good for benign islet-cell adenomas, and the success rate for malignant islet-cell tumors can be as high as 50%. Hypoglycemia is a clinical situation characterized by a reduction in plasma glucose concentration to a level that may induce symptoms or signs such as altered mental status and/or sympathetic nervous system stimulation. The glucose level at which an individual becomes symptomatic is highly variable, although a plasma glucose level less than 50 mg/dL is generally considered the threshold. Hypoglycemia typically arises from abnormalities in the mechanisms involved in glucose homeostasis. To diagnose hypoglycemia, the Whipple triad is characteristically present. This triad includes the documentation of low blood sugar, presence of symptoms, and reversal of these symptoms when the blood sugar level is restored to normal. 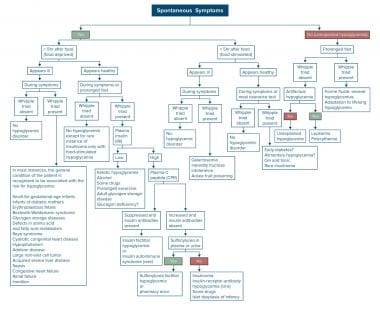 See a diagnostic algorithm for hypoglycemia, below. See also Pediatric Hypoglycemia, Neonatal Hypoglycemia, Emergent Management of Acute Symptoms of Hypoglycemia, and Congenital Hyperinsulinism. Hypoglycemic symptoms are related to sympathetic activation and brain dysfunction secondary to decreased levels of glucose. Stimulation of the sympathoadrenal nervous system leads to sweating, palpitations, tremulousness, anxiety, and hunger. Reduction in cerebral glucose availability (ie, neuroglycopenia) can manifest as confusion, difficulty with concentration, irritability, hallucinations, focal impairments (eg, hemiplegia), and, eventually, coma and death. The adrenergic symptoms often precede the neuroglycopenic symptoms and, thus, provide an early warning system for the patient. Studies have shown that the primary stimulus for the release of catecholamines is the absolute level of plasma glucose; the rate of decrease of glucose is less important. Previous blood sugar levels can influence an individual's response to a particular level of blood sugar. However, it is important to note that a patient with repeated hypoglycemia can have almost no symptoms (hypoglycemic unawareness). The threshold at which a patient feels the hypoglycemic symptoms decreases with repeated episodes of hypoglycemia. Causes of hypoglycemia are varied, but it is seen most often in diabetic patients. Hypoglycemia may result from medication changes or overdoses, infection, diet changes, metabolic changes over time, or activity changes; however, no acute cause may be found. Other causes include alimentary problems, idiopathic causes, fasting, insulinoma, endocrine problems, extrapancreatic causes, hepatic disease, post bariatric surgery, and miscellaneous causes. Nesidioblastosis is a rare cause of fasting hypoglycemia in infants and an extremely rare cause in adults. This condition is characterized by a diffuse budding of insulin-secreting cells from pancreatic duct epithelium and pancreatic microadenomas of such cells. Causes of fasting hypoglycemia usually diagnosed in infancy or childhood include inherited liver enzyme deficiencies that restrict hepatic glucose release (deficiencies of glucose-6-phosphatase, fructose-1,6-diphosphatase, phosphorylase, pyruvate carboxylase, phosphoenolpyruvate carboxykinase, or glycogen synthetase). Inherited defects in fatty acid oxidation, including those resulting from systemic carnitine deficiency and inherited defects in ketogenesis (3-hydroxy-3-methylglutaryl-CoA lyase deficiency), cause fasting hypoglycemia by restricting the extent to which nonneural tissues can derive their energy from plasma free fatty acids (FFA) and ketones during fasting or exercise. This results in an abnormally high rate of glucose uptake by nonneural tissues under these conditions. Several cases of nesidioblastosis were reported recently after gastric bypass surgery. Ethanol (including propranolol plus ethanol), haloperidol, pentamidine, quinine, salicylates, and sulfonamides ("sulfa drugs") have been associated with hypoglycemia. Other drugs that may be related to this condition include oral hypoglycemics, phenylbutazone, insulin, bishydroxycoumarin, p-aminobenzoic acid, propoxyphene, stanozolol, hypoglycin, carbamate insecticide, disopyramide, isoniazid, methanol, methotrexate, tricyclic antidepressants, cytotoxic agents, organophosphates, didanosine, chlorpromazine, fluoxetine, sertraline, fenfluramine, trimethoprim, 6-mercaptopurine, thiazide diuretics, thioglycolate, tremetol, ritodrine, disodium ethylenediaminetetraacetic acid (EDTA), clofibrate, angiotensin converting enzyme (ACE) inhibitors, and lithium. Factitious hypoglycemia or self-induced hypoglycemia can be seen in healthcare workers or in relatives who care for diabetic family members at home. (see Type 1 Diabetes Mellitus and Type 2 Diabetes Mellitus for further discussion, including the diagnostic use of C-peptide levels and HbA1c). Surreptitious use of insulin may be seen, typically among those likely to have access to insulin. Measurement of insulin level along with C-peptide is very crucial in making this diagnosis. Sources of endogenous insulin include insulin-producing tumors of pancreas and non–beta-cell tumors. Islet cell adenoma or carcinoma (insulinoma) is an uncommon and usually curable cause of fasting hypoglycemia and is most often diagnosed in adults. It may occur as an isolated abnormality or as a component of the multiple endocrine neoplasia type I (MEN I) syndrome. Carcinomas account for only 10% of insulin-secreting islet cell tumors. Hypoglycemia in patients with islet cell adenomas results from uncontrolled insulin secretion, which may be clinically determined during fasting and exercise. Approximately 60% of patients with insulinoma are female. Insulinomas are uncommon in persons younger than 20 years and are rare in those younger than 5 years. The median age at diagnosis is about 50 years, except in patients with MEN syndrome, in which the median age is in the mid third decade of life. Ten percent of patients with insulinoma are older than 70 years. Hypoglycemia may also be caused by large non–insulin-secreting tumors, most commonly retroperitoneal or mediastinal malignant mesenchymal tumors. The tumor secretes abnormal insulinlike growth factor (large IGF-II), which does not bind to its plasma binding proteins. This increase in free IGF-II exerts hypoglycemia through the IGF-I or the insulin receptors. The hypoglycemia is corrected when the tumor is completely or partially removed and usually recurs when the tumor regrows. Reactive hypoglycemia can be idiopathic, due to alimentary problems, or a result of congenital enzyme deficiencies. Alimentary hypoglycemia is another form of reactive hypoglycemia that occurs in patients who have had previous upper gastrointestinal (GI) surgical procedures (gastrectomy, gastrojejunostomy, vagotomy, pyloroplasty) and allows rapid glucose entry and absorption in the intestine, provoking excessive insulin response to a meal. This may occur within 1-3 hours after a meal. Very rare cases of idiopathic alimentary hypoglycemia occur in patients who have not had GI operations. Congenital enzyme deficiencies include hereditary fructose intolerance, galactosemia, and leucine sensitivity of childhood. In hereditary fructose intolerance and galactosemia, an inherited deficiency of a hepatic enzyme causes acute inhibition of hepatic glucose output when fructose or galactose is ingested. Leucine provokes an exaggerated insulin secretory response to a meal and reactive hypoglycemia in patients with leucine sensitivity of childhood. The incidence of hypoglycemia in a population is difficult to ascertain. Patients and physicians frequently attribute symptoms (eg, anxiety, irritability, hunger) to hypoglycemia without documenting the presence of low blood sugar. The true prevalence of hypoglycemia, with blood sugar levels below 50 mg/dL, is generally 5-10% of people presenting with symptoms suggestive of hypoglycemia. Insulin-producing tumors are a rare but important treatable cause of hypoglycemia, with an annual US incidence of 1-2 cases per million persons per year. The prognosis of hypoglycemia depends on the cause of this condition, its severity, and its duration. If the cause of fasting hypoglycemia is identified and treated early, the prognosis is excellent. If the problem is not curable, such as an inoperable malignant tumor, the long-term prognosis is poor. However, note that these tumors may progress rather slowly. Severe and prolonged hypoglycemia can be life threatening and may be associated with increased mortality in patients with diabetes. If the patient has reactive hypoglycemia, symptoms often spontaneously improve over time, and the long-term prognosis is very good. Reactive hypoglycemia is often treated successfully with dietary changes and is associated with minimal morbidity. Mortality is not observed. Untreated reactive hypoglycemia may cause significant discomfort to the patient, but long-term sequelae are not likely.